£289 non-residential. Suggestions for inexpensive accommodation is available on booking. Jill's unique method of using chant and family constellations, heals the resonant field of the family, and finds the piece of the puzzle which unlocks persistent patterns, so order is restored and the family system opened to the light of revelation and redemption, she finds the keys that set the individual and the family and later generations free. Working ceremonially with the resonant fields of the family. Revealing the dynamic of their patterns in order to restore order. Transforming inherited destructive influences into the blessings which can change our life and the lives of all family members. As families and ancestors are resonant fields, Jill has found that one of the most effective ways of healing them is through resonance and the voice, in the context of ceremony and family constellations. By working in the present we are able to change the past and the future. When earlier family members in previous generations have died or left the family young or in unusual circumstances, something of the nature of this persons departure gets frozen in time and creates a magnet for later generations to follow them. By disentangling people from the patterns of earlier members of the family, we are able to clear the field for this and the next generations where they do or might exist. 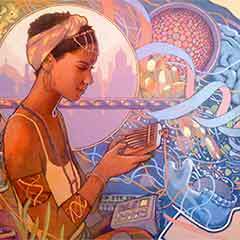 The work is intense and oracular and profoundly healing and seems to uncover restore aspects of the psyche closed to normal therapeutic methods. 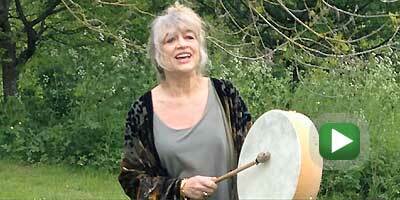 Jill prefers it if possible you are able do the Friday one day Voice of Shamanism workshop together with the weekend. The IONS International pre-conference workshop involves a unique combination of family constellations, chant and ceremony. Healing inherited patterns laid down by earlier ancestral and family members. Finding the keys which set both us and future generations free of the unconscious compulsions caused by earlier traumas, injustices or separations between family members.